Mamaearth brings to you a milky soft face cream with the goodness of almond oil and murumuru butter. 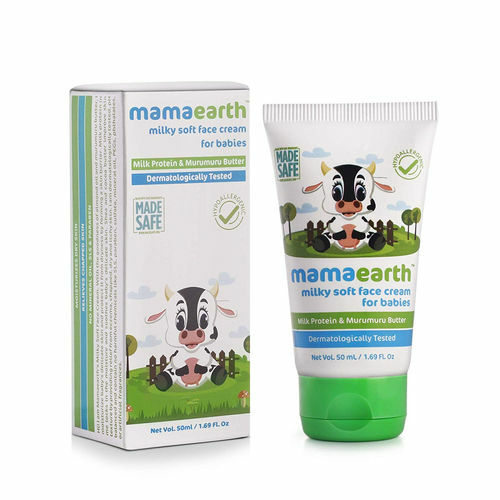 Mamaearth‘s baby face cream is specially formulated with care for the delicate, soft and sensitive skin of babies. It also soothes and intensely moisturizes baby’s itchy and extra dry skin. Enriched with shea and cocoa butter, it improves skin texture by providing relief from eczema, chapped, dry and itchy skin. Formulated with Milk Protein and Lavender oil, it acts as a skin protectant. It maintains natural skin protective barrier and keeps baby’s skin soft, smooth, and healthy. Mamaearth Milky Soft Baby Face Cream is dermatologically tested, pH balanced and contains no harmful chemicals like sls, paraben, sulfate, mineral oil, pegs, phthalates or artificial fragrances. Explore the entire range of Face Moisturizer & Day Cream available on Nykaa. Shop more Mamaearth products here.You can browse through the complete world of Mamaearth Face Moisturizer & Day Cream .